Long gone are the days when people would say, “Why wear a watch when you can check the time on your mobile?” or that “It is a staple accessory for men only”. From a usual day at college, university or workplace to a formal lunch or a dinner date, a wristwatch is one classy go-to accessory that can spice up any look. While the high-end branded watches by leading brands across the world may not be everyone’s cup of tea, many new local retailers and websites are sprouting up, which deal with a huge variety of watches that you can purchase without going bankrupt. Amazing, isn’t it? 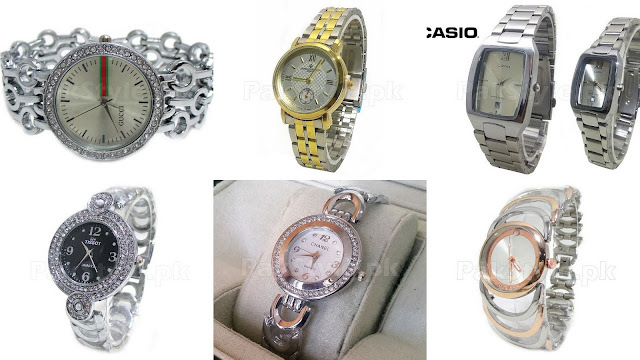 Read on to find out more about such pocket savvy latest trends and collections of wrist watches. The thing with Ladies Watches is as they say, “A woman can never have enough clothes and shoes”, and the same rule of thumb applies for a wristwatch. It would not be wrong to say that a wristwatch is the handiest staple accessory for the woman of today, who believes in exhibiting beauty-with-brains. Like every other accessory, you need one for every occasion. The best thing about the amazing new trends in wristwatches that emerged in 2016 is that they offer something for everyone. While a floral wristwatch would sport a casual T-shirt and jeans look best, a geometrically patterned knitted watch is all the rage for its Bohemian vibe. Planning on hanging out with friends this weekend? A multicoloured woven watch like this one can be paired perfectly with an easy breezy, floral or plain chiffon flared long dress or a long skirt. The obsession with Turkish jewellery across the world (especially Pakistan) is apparently not going to end anytime soon. Jewelled Turkish style watches, which can be best worn during the festive season, are another addition to the latest wristwatch trends. 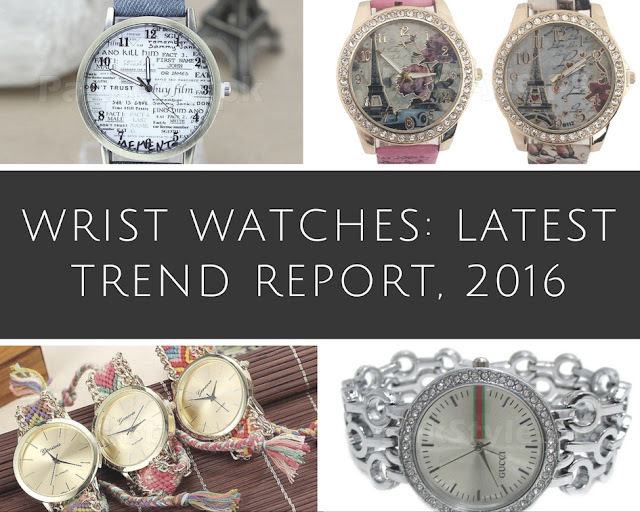 If you're into all-things-vintage, the denim watch or Eiffel Tower watch is sure to make your style game strong. Also, there are those with charms, chains and beads, which the younger lot (read: college and university going girls) can sport on any day, from the bonfire golden night to just any other day at the institution. 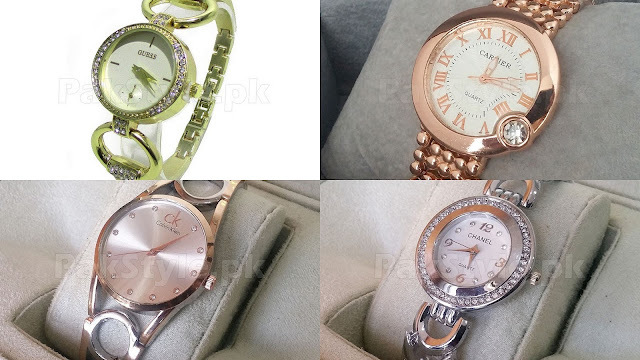 Those who want their watches to match each and every outfit or pair of shoes they wear can go for the easy-on-pocket watch set which comes with interchangeable straps. If you aim for creating a classy (read: conventional/universally acceptable) fashion statement, the metal or precious metal watches in silver, and especially gold and rose-gold are all the rage. Looking for a luxurious alternative and ready to splurge some (Read: A LOT, actually) more? A gold or titanium plated watch with a few gemstones is for you. If carried appropriately, such wristwatches can be worn at formal events and corporate meetings alike. Looking for a simple looking decent watch for work which is basically like the jack-of-all-trades kind of wrist watch, go for a leather or faux leather wristwatch. 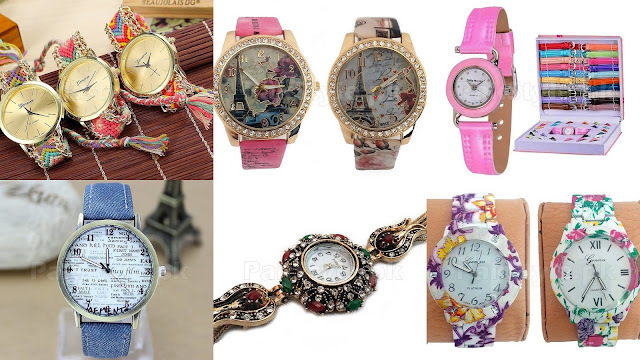 While designer watches can never lose their charm and luxurious appeal for many, if you are a freak like myself, who would prefer buying one for every occasion, purchasing good quality replicas do not hurt anyone, right? Not even your pocket. *face palm* If you’re looking a one-stop shop for buying wrist watches and neither your time nor your lazy feet allow you to go hunt for one, from one store to another, Watches Online Shopping destinations have your problem sorted. Nothing can beat the ease that comes with purchasing a watch that meets your requirements online and having it delivered to your doorstep. Still facing trouble in choosing the perfect watch for yourself? That is when the Watches Buying Guide comes in handy. The key to shopping for a wrist watch online is to determine your budget (you do not want to create a hole in your pocket, do you? ), surf the internet for the latest trends in watches, the occasion you want it for, materials including the strap/chain and dial size and number markers (analogue or digital) you are comfortable with, and evaluate watch features, such as, water resistance and heat monitoring etc that you require. Hope y’all enjoyed reading out the latest trend report on wristwatches and are better able to know (and choose) your type now and decide on when to wear which one.